It was a spectacularly beautiful Saturday in San Francisco. Exactly the perfect day to do some field usability testing. But this was no ordinary field usability test. Sure, there’d been plenty of planning and organizing ahead of time. And there would be data analysis afterward. What made this test different from most usability tests? On average, teams came back with data from 6 or 7 participants. Not bad for a 3-hour stretch of doing sessions. Though you might think that the 3-or-so hours of data collection might be dull and boring for the coordinator, there were all kinds of things for me to do: resolve issues with locations, answer questions about possible participants, reconfigure teams when people had to leave early. Cell phones were probably the most important tool of the day. I am still astonished that a bunch of people would show up on a Saturday morning to conduct a usability study in the street without much preparation. If your team is half as excited about the designs you are working on as this team was, taking a field trip to do a flash mob usability test should be a great experience. That is the most important ingredient to making a flash mob test work: people to do research who are engaged with the project, and enthusiastic about getting feedback from users. Starting about 3 or 4 weeks ahead of time, pick the research questions, put together what needs to be tested, create the necessary materials, choose a date and locations, and recruit researchers. Introduce all the researchers ahead of time, by email. Make the materials available to everyone to review or at least peek at as soon as possible. Nudge everyone to look at the stuff ahead of time, just to prepare. About 10 days ahead, I chose a lead for each of the teams (these were all people who I knew were experienced user researchers) and talked with them. I put all the stuff listed above in a large, durable envelope with the team lead’s name on it. The sessions were going to be short, and the note-taking awkward because of doing this research in ad hoc places, so I wanted to make data collection as easy as possible. 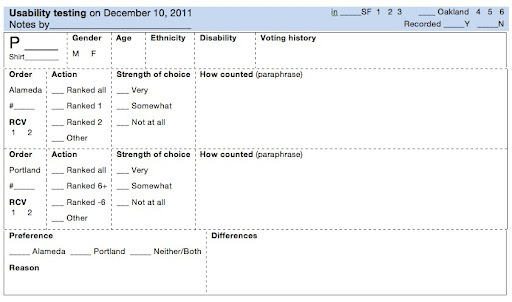 Working from a form I borrowed from Whitney Quesenbery, I made something that I hoped would be quick and easy to fill in and easy for me to understand what the data meant later. The data collection form was the main thing I spent time on in the briefing before everyone went off to collect data. There are things I will emphasize more, next time, but overall, this worked pretty well. One note: It is quite difficult to collect qualitative data in the wild by writing things down. Better to audio record. While the form was reasonably successful, there were some parts of it that didn’t work that well. Though a version of the form had been used in other studies before, I didn’t ask enough questions about the success or failure of the open text (qualitative data) part of the form. I wanted that data desperately, but it came back pretty messy. Testing the data collection form with someone else would have told me what questions researchers would have about that (meta, no? ), and I could have done something else. Next time. Maximize participant time by dedicating as much time to the session as possible to their interacting with the design. That means that the moderator does nothing to introduce the session, instead relying on an informed consent form that one of the team members can administer to the next participant while the current one is finishing up. The other tip here is to write out the exact wording for the session (with primary and follow up questions), and threaten the researchers with being flogged with a wet noodle if they don’t follow the script. When and where to meet when they were done. I also handed cash that the researchers could use for transit or parking or lunch, or just keep. Put the youngest and/or best-looking person on the task. Using cute pets to attract people. Two researchers who own golden retrievers brought their lovely dogs with them, which was a nice icebreaker. Take turns – it can be exhausting enduring rejection. Before the researchers went off to their assigned locations, I asked each team to check that they had everything they needed, which apparently was not thorough enough for one of my teams. Next time, I will ask each team to empty out the contents of the packet and check the contents. I’ll use the list of things I wanted to include in each team’s packet and my agenda items for the briefing to ask the teams to look for each item. Even with lots of planning and organizing, things happen that you couldn’t have anticipated. Researchers don’t show up, or their schedules have shifted. Locations turn out to not be so perfect. Give teams permission to do whatever they think is the right thing to get the data – short of breaking the law. Teams checked in when they found their location, between sessions, and when they were on their way back to the meeting spot. I wanted to know that they weren’t lost, that everything was okay, and that they were finding people to take part. Asking teams to check in also gave them permission to ask me questions or help them make decisions so they could get the best data, or tell me what they were doing that was different from the plan. Basically, it was one giant exercise in The Doctrine of No Surprise. I needed to get the data from the research teams at some point. Why not meet up again and share experiences? Turns out that the stories from each team were important to all the other teams, and extremely helpful to me. They talked about the participants they’d had and the issues participants ran into with the designs we were testing. They also talked about their experiences with testing this way, which they all seemed to love. Afterward, I got emails from at least half the group volunteering to do it again. They had all had an adventure, met a lot of new people, got some practice with skills, and helped the world be a become a better place through design. P.S. I did not originate this approach to usability testing. As far as I know, the first person to do it was Whitney Quesenbery in New York City in the autumn of 2010. Sounds both brave and fun! So did anyone take off their pants? It was super fun, and I was really pleased with the results. Not just the data, but how excited the team got about meeting users and interacting with them. No, no one took their pants off, but it happened to be the same day as Santa Con, which meant that there were at least 10,000 drunk people in santa outfits all over the city. Except for the naked santas who were trying to beat the world record for the largest number of naked santas in Washington Square at one time. How did you know if they were santas if they were naked, you ask? They kept their hats on. Great adventure in the streets.